I have completed all of Philip Roth’s Zuckerman books! 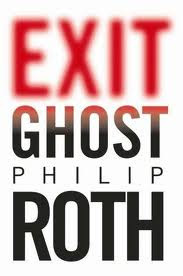 Exit Ghost is the ninth entry in the series and as per Roth, the last. This work is a fine farewell to Nathan Zuckerman, Roth’s long running protagonist that some also consider his alter ego. As this novel wraps things up and involves connections with some of what has gone before, I would strongly recommend at least reading the first Zuckerman book, Ghost Writer and preferably the first four books which are collected under one volume, Zuckerman Bound, before attempting this one. In 2004, after eleven years of self imposed exile in rural Massachusetts, Zuckerman has finally returned to the formally familiar New York City. At age seventy-one the fictional writer of fiction is falling apart both mentally and physically. He is both impotent as well as incontinent and is also beginning to show signs of mental decay, likely the result of Alzheimer’s disease. Zuckerman encounters a host of both new and old characters. He meets a thirtyish couple, Billy Davidoff and Jamie Logan. The married pair are struggling writers whose fear of a post 09/11 terrorist attack is counterbalanced by their strong ire and despair over the Bush administration and its policies. Zuckerman becomes smitten and somewhat obsessed with Jamie. However, the former womanizer is reduced to writing intellectualized romantic fantasies of an encounter with her in lieu of the real thing. Zuckerman also encounters for the first time in nearly fifty years, Amy Bellette. This is where an intimate connection is established with the first Zuckerman novel, The Ghost Writer. In that work, set in 1956, a young Zuckerman is invited to the home of his literary idol E.I. Lonoff. During his visit Zuckerman witnesses the breakup of Lonoff’s marriage precipitated by an affair with Lonoff’s young protégée Amy. At this time Zuckerman is also erotically and intellectually drawn to Amy. In a plot twist related to Zuckerman’s ongoing theme of shifting identities, Zuckerman comes to believe in a strange fantasy that Amy is actually Ann Frank who has survived the Holocaust. Zuckerman does eventually come to realize that this belief is apocryphal. In Exit Ghost we learn that following the events described in The Ghost Writer, Lonoff and Amy married. In the ensuing four years Lonoff, who had previously only penned short stories, was working on a novel. Progress on the book was cut short by his death. An aged Amy is now poverty stricken and declining due to a brain tumor. Richard Kliman, a friend of Jamie, is badgering both Zuckerman and Amy as he is attempting to put together a biography of Lonoff that will highlight a supposed scandalous affair between the writer and his sister. Richard believes that the aborted novel was a fictionalized account of the incestuous relationship. Richard is aggressive and arrogant. Zuckerman is appalled by Richard’s ways but he does remind our protagonist of his own younger self. Both Zuckerman and Amy philosophically object to Richard’s digging for scandal as well as the entire concept of searching for real events and people when attempting to explain the work of a fiction writer. The ever-cagey Roth seems to provide evidence in support of both sides to this argument. There are so many themes presented in this book that it is difficult to coherently summarize them all. The motifs also interact and intertwine with one another further defying systematic description. Of course there is Roth’s old standby of identity and people’s perception of it. In addition, there is the question of whether fiction is a mirror of reality and real people and events, verses being only a product of a writer’s imagination. There is also an exploration of the issues surrounding once young and vibrant people coping with physical and mental decline. There are serious ruminations on the philosophical ramifications on isolation and voluntary withdrawal from the world and its travails. Roth also delves into the concept of an older person trying to connect and come to terms with both the past and the present. There are multiple references to Joseph Conrad’s “The Shadow Line”. I have not read that work, but a little research leads me to believe that it was concerned with related themes. As if Roth did not have enough to cram in here, Exit Ghost is also very political, excoriating the American right wing. At one point Zuckerman describes George W. Bush as an “Imbecile King”. Since this is the last that time that we are likely to visit Nathan Zuckerman I will try to focus on his character here as well as in the proceeding books. Though never a simplistic persona, Roth seems to be suggesting that there are two overriding aspects that defined Zuckerman’s life as well as his own perception of himself. First, his gift at writing great and meaningful fiction that is a reflection of the real world. Second, as we saw in previous books, he was an enormously promiscuous womanizer. Zuckerman had affair after affair, sometimes simultaneously with a vast assortment of women. The trysts were only interspaced with a string of short lived and unsuccessful marriages. Eleven years prior to the events of Exit Ghost Zuckerman became impotent which put an end to his sexual and emotional escapades and was one of several factors that prompted his withdrawal and isolation from the world. As this novel proceeds, it is apparent to both Zuckerman and the reader that senility is closing in and that he is now also losing his ability to write. Zuckerman is strongly attracted to Jamie who he knows that he cannot have for many reasons. I get the sense that he feels that in his younger days he would have found it easy to seduce this woman. Roth however throws out some hints that he may hold a distorted vision of his former powers. Once again we see some difference in perception of self verses reality. Roth’s books often contain fictions within fictions. In what is likely to be his last creative piece, Zuckerman is writing a short play titled “He and She” about a flirtation between himself and Jamie. What makes this fiction interesting is that it is not completely off the wall, but it does vary from reality subtly. For Zuckerman, writing these variations and extrapolations on reality is a part of who he is and how he exists in the world. At one point he ruminates on the subject. Jamie’s character in “He and She” is different, but only a little different, from the real women. Again, the theme of perception verses reality rears its head as some aspects of the story are based upon false impressions that Zuckerman has drawn. Of course the people that I am referring to as “real” are fictional characters themselves in Exit Ghost. This confusion is clearly Roth playing with the idea of storytelling and identity again. Jamie, in “real” life, is confident about her physical attractiveness. However, her fictionalized persona is just a little more self assured and sexually confident then the actual “real” woman. Zuckerman’s fictional Jamie is likely having an extramarital affair with Richard, where in reality Jamie seems to be faithful to her husband. Finally in reality, Zuckerman attempts to seduce Jamie over the phone and induce her to visit his hotel room. He fails in his attempt. In his fictional account however, Zuckerman secedes in convincing her. As she is on her way to the liaison, the fictional Zuckerman, who is also impotent in the tale as well, flees the hotel and New York before she arrives, having lost his abilities both sexually and creatively. The fictional Zuckerman, and presumably the real Zuckerman, whose former powers have vanished, will return to isolation, probably until the end. The story within the story, “He and She” says a lot about Zuckerman. As he alludes to, Zuckerman perceives his fictions as reflections and interpretations of the real world, pain included. He is still egotistical enough to believe that he can talk a women forty years his junior into an affair, but is facing the reality that he would be unable to perform in such a situation. With the loss of his mental faculties and his inability to think and write, he withdraws himself from the world that he once thrived in. He does so without sentimentality or even a strong sense of despair. Since Roth has effectively conveyed these feelings in other characters, I must assume that this is no oversight here. Once again, I have barely touched upon the themes, philosophic ruminations and character studies found in this work. Exit Ghost is an extraordinary swan song for Zuckerman. Like real life, many of the story threads as well as themes are left unresolved. For fans of Roth and the series, this is very well done finale. Emma at Book around the Corner has some really good commentary up on this book here. I also have also written commentary on other Zuckerman books, The Human Stain and I Married a Communist. One might have an initial impression that this is a very unusual book commentary to be found on this blog. However, those who have read, or even perused, a bit of The Cheese Primer by Steven Jenkins will know that this work, aside from being a gastronome’s delight, will fit right in with many of the other writings explored here. It is, after all, a book about history and culture as well as an important exposition and commentary on the ubiquitous human activity known as eating. Jenkins even expounds upon what I would define as a food philosophy here. This nifty book can be used either as a reference utility for both the novice and the experienced cheese buyer, skimmed for its most interesting content, or even read from cover to cover. Jenkins is one of America’s foremost experts on cheese. He was the first American invited into the prestigious Guilde de St. Uguzon and he is a Chevalier du Taste-Fromage. What does that mean? It means that when it comes to cheese, Jenkins is internationally recognized as knowing his stuff! Jenkins also runs the cheese buying and retail operations at Fairway Market. Fairway is a small chain of specialty food markets located in the New York City area. One of the best things about Fairway is that I am fortunate enough to work near one! Fairway’s cheese department is one of the best that I have encountered in America. One of the most negative things that I can say about this book is that it has a terrible title! 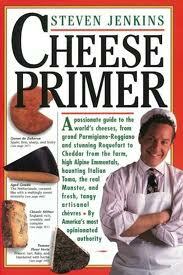 “Cheese Primer” has dull connotations. If a prospective reader did not know any better they might suspect that this was a dry and soulless catalogue. Instead, Jenkins has mapped out a wondrous journey for anyone inclined to indulge in this delicious form of fermented milk. This is a highly recommended read for anyone who loves and wants to understand cheese, as well as for those who are interested in the history and culture of food. In the first several chapters Jenkins enunciates a little bit about himself and how he became an expert on this subject. He then spends some space discussing some fascinating technicalities as to how cheese is created. Subsequent chapters are broken down by country. Each chapter is devoted to a different cheese- making nation. The major producing nations have chapters subdivided into regions. Along the way he gives us a little bit of the history of each cheese-producing region and how the area’s history, food and culture relates to cheese. Jenkins then proceeds to provide solid cheese buying advice to the consumer. As a reference source, the book is mostly aimed at the American cheese buyer. The author later goes on to describe the slightly less incredible cheeses and their cultural connections in Italy, the UK, Spain, Germany, etc. Jenkins does turn his eye to American cheese producers. Despite being the home country of giant conglomerates that make bland mass produced foods that are sometimes not even legal to call cheese, America has a burgeoning artisanal cheese industry. Small farms making world- class cheese from cows, sheep and goats are popping up in all fifty states. In part thanks to Jenkins’s book, whenever my wife and I visit a part of America away from home, my we make it our mission to visit a small cheese farm or two in that area. Many of these farms welcome visitors. What we find on these outings are educational, and most importantly they yield delicious results! Jenkins also has important things to say about modern food industry and culture. The author is opinionated. I happen to agree with most of his views. Jenkins points out that artisanal cheese production and consumption is diminishing throughout the world. Great cheeses that have been produced for hundreds of years are becoming extinct. He is highly critical of the mass produced factory cheeses and imitation cheese products that consumers in America and elsewhere now consume in copious amounts. “As for Edam – Simply consider it lost to us for all time”. Ultimately, this is a book that champions the culture and joy of real food over the artificial, food products that have invaded many people’s lives. Jenkins is saying something important about the modern world here. Mass produced corporate food is diminishing our lives and our cultures. It is destroying much that is good and wonderful. I am very much with Jenkins. I do my best to find and appreciate real foods made by small producers that are fashioned with love. I always prefer such foods to mass produced factory products. I lament the fact that so many people in America only know factory made foods. Many folks actually prefer processed foods that are filled with salt, processed sugar, Monosodium Glutamate, hormones and who knows what else, to the real thing made by small producers in the right way. My own theory is that constant exposure to insipid and simplistic sensations ruins our appreciation for strong, genuine flavors such as biter, sour, nutty, musky, etc. Thus, when people try food that contains these real flavors the experience is initially too strong and complex for them. We need more evangelists like Jenkins to help keep the authentic alive in the face of a massive onslaught by the plastic and superficial. Some people have told me that various trendy self-help books would have an enormous impact upon my life. Others have assured me that certain religious texts would lead me to great epiphanies. Alas, none of these tomes have brought me the promised life altering benefits. However, as the book that jump started and continues to fuel my interest and love of cheese, The Cheese Primer is the manuscript that finally did change my life in ways that so many others have promised! 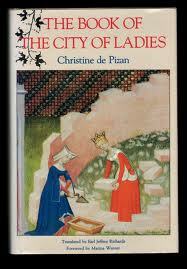 Born in 1363, Christine de Pizan was a poet and writer of prose. Originally from Venice, she lived most of her life in France. She penned The Book of the City of Ladies as a response to misogynistic attitudes expounded by writers both in her time as well as in the past. I would argue that Christine’s work is both entertaining and, for its time, contained a great many important, original and even revolutionary ideas. The story opens with the author herself reading a book that was popular at the time and that strongly attacked both the character of women as a class of people as well as the institution of marriage. While contemplating all of the negative writing and thought directed toward the female gender throughout the ages, Christine falls into depression. She despairs at the fact that she was born a woman who she acknowledges to be a member of a class of wicked and inferior human beings. Christine is later visited in a dream by three ladies: Reason, Rectitude and Justice. The visitors convince the author that anti - female writers are wrong and that their ideas are based upon a lack of intelligence and virtue. They set out to help Christine build an allegorical city comprised of brilliant, moral and just women. The remaining bulk of the work consists of interesting, entertaining and sometimes disturbing vignettes enunciating tales of both real and mythological women who displayed such positive traits such as courage, intelligence, wisdom, loyalty, piety honor, etc. Rosalind Brown-Gran, who also provides an introduction and commentary, translated the version of The Book of the City of Ladies that I read. Brown-Gran points out that this early brand of “feminism” espoused in Christine’s book is not the modern version that twenty-first century readers are accustomed to. Certainly Christine works hard to dispel misogynistic belief systems and sets out to prove that intellectually, morally and spiritually women are equal to men. Brown-Gran argues, however, that Christine and her portraits also emphasize that the proper role for women under most circumstances is in the home and supportive of their husbands’ endeavors. Christine espouses the point of view that usually, the best role for women is that of a loyal and virtuous wife, keepers of home and caretakers of the family. In fact Christine seems to support the idea that it is even beneficial for women to stand by husbands who are abusive. On the other hand, many of the stories portray men acting abusively and sadistically towards women who are almost virtuous beyond belief. The last part of the work showcases the lives of saintly women ranging from the Virgin Mary to various martyrs who showed extreme piety in their service to God. Many of these stories involve scenarios where these devout women endured horrendous torture and mutilation but always remained chaste and loyal to the Christian God. To me, the multiple outrages perpetuated by men against these women described here support the suggestion that Christine is saying that in general, women are less sinful and closer to God in some ways than are men. There are strong intuitions here that women, at least in general, are better people than are men after all. At the risk of sounding a little bit “reverse sexist”, in a world full of violence that has been and is still mostly perpetuated my men, Christine may have a point here. With such a mix of ideas, I think that Christine’s views can most correctly be described as “proto – feminist”. However, there is something else going on here. I perceive more in this work. I would argue that some of Christine’s ideas were revolutionary and uncannily modern. The author expresses and perhaps generates certain philosophies that for the time were radical. In of itself, the concept of defending women against bias, as well as championing their wisdom and virtue, could be considered radical in the fourteenth and fifteenth centuries. Christine does not stop there however. The character Christine experiences great changes during the narrative. Exposed to unceasing misogynistic ideology, she is initially convinced of the veracity of these thought systems. As a result, she enters into a fugue of despair and self-hatred. Later, however, Christine comes to see that such a characterization of women is grossly unjust. Furthermore, the men who have perpetuated it do so because it is they who are endowed with character flaws. Such men are ignorant, insecure, petty, jealous, shortsighted, and, in some cases, obsessed with their own sinful pasts. Christine comes to realize that it is the victimizer who is at fault, not the victim. This transformation of a member of an oppressed group who initially identifies with her oppressors, but is eventually liberated by the knowledge that her and other members of her group are intelligent and virtuous, seems very out of place in Christine’s time. I am certainly not qualified to say if this concept was first espoused in The Book of the City of Ladies. Of course there was plenty of precedent for the oppressed individual fighting oppressors who were clearly evil in the literature produced up to the this era. In particular, many of the narratives involving the lives of the Saints followed this pattern. But what Christine is saying here is different. Women are not demonized because of their beliefs; instead they are demonized because they are part of a group that they were born into. Narratives that included early periods self-loathing were also not new in Christine’s time. Literature abounds with accounts where a sinner falls into despair as a result of their shortcomings but eventually reforms as God redeems the person. St. Augustine’s Confessions is a good example of this. Once again Christine presents a different story, however. Her self-hatred is based on incorrect assumptions fostered by misguided and flawed men. It was unjustified. This could not have been common thinking for the time. This train of reasoning seems incredibly influential upon subsequent writing and theorizing about oppressed minorities and groups. In some ways it reminds me of eighteenth and nineteenth century slave narratives where the slave starts out identifying with their owner’s ideology and feels enormous self-hatred. Later, the oppressed individual experiences an awakening and comes to understand that their slavery is based upon evil and injustice. Christine’s thinking seems way ahead of her time here. Another surprising idea that I found here is the concept that thinking of people in stereotypes is flawed. I think that the above is remarkable for the period. Christine is actually identifying what today we would call stereotyping and rejects it! This line of thinking, perhaps passé to us in the twenty-first century, is something that I never realized was espoused this far back. This further leads Christine and the reader to additional conclusions based upon evaluating and judging a person by their thinking and choices as opposed to gender. This seems to me to be another groundbreaking statement for the time. In historical and cultural analyses of the eighteenth and nineteenth century, many writers and historians, Gordon Wood comes to mind, argue that the concept of who a person is should be based upon merit and accomplishments, as opposed to circumstances and birth, has developed and blossomed in those later centuries. Of course Christine is only talking about gender here, not class, birthright or ethnicity. However, I would contend that this was an important first step. Here is Christine, championing an early form of this egalitarian ideology, four hundred years before then revolutionaries of the Enlightenment! This work will appeal to those interested in medieval literature, feminism and its history, or the progression of human ideas and society. I am personally a little bit in awe of Christine’s innovative thinking. She was centuries ahead of her time. The Book of the City of Ladies is evidence that Christine deserves a place among humankind’s great minds. Coincidentally while reading this work I realized that over at A Year of Feminist Classics Blog there was a group reading and discussion on this book that wrapped up a few months ago. Unfortunately I missed most of it but there was some good commentary over there. Ray Bradbury died this week. Bradbury had such an early and profound impact upon my literary tastes as well as upon my thinking. From about sixth grade on I devoured science fiction books. One of the first works that read was The Martian Chronicles. In the ensuing years I moved on to The Illustrated Man, Fahrenheit 451, Something Wicked This Way Comes as well as additional short stories. Bradbury was one of the first really great writers that I encountered. While not very aware of theme and characters in those years. I did sense that Bradbury was three or four cuts above the average science fiction writer. His prose was always very poetic and he sometimes wrote whimsical passages in the midst of stories that were otherwise hard science fiction. His tales were cautionary and often pointed to human folly especially when tied to the misuse of technology. He also expressed a strong distrust regarding popular or “mass” thinking that really struck a cord with me. I still remember when ninth grade English class teacher assigned Fahrenheit 451 how happy and surprised I was as I had already read it! Though this may be his most famous work, his other books may actually be stronger. Though I have only reread Fahrenheit 451 in my “aware” adulthood, I do seem to remember the other works somewhat vivid detail. In retrospect they really made an impression upon me. It is high time that I revisit these books. Ron Chernow’s Alexander Hamilton is a massive and comprehensive account of this American Founder’s life. In this work the author presents a balanced account of Hamilton’s momentous existence. The narrative is interesting as it is detailed. This book spans over seven hundred pages of fairly dense writing and will satisfy all but the most serious scholar. For all its intricacies it is a page-turner that is difficult to put down if one has any interest in the subjects covered. Though sometimes a little too apologetic about Hamilton’s enormous character flaws and questionable actions, Chernow honestly illustrates the good, the bad and the in–between that encompassed Alexander Hamilton. Of Scottish and French descent, Hamilton was born around 1755 in Charlestown, on the island of Nevis. He later spent most of his impoverished and tumultuous childhood on the nearby island of St. Croix. Hamilton experienced misery at a young age. His father abandoned his family and his mother died when Hamilton was only eleven, leaving the boy to be raised by relatives. In 1772 Hamilton immigrated to America. After several years of college, he joined the Revolutionary Army in the war for independence against Britain. Though he saw combat, Hamilton’s most notable role in the conflict was as the secretary and aide to General George Washington. The association and friendship that developed during this period spanned the remainder of Washington’s life. During this time Hamilton also established relationships with such key personages as Henry Knox and the Marquis de Lafayette. Hamilton possessed a vast intellect. Even during the war years he studied and became extremely versed in the subjects that we would label today as economics and finance. These interests would serve both himself as well as the young United States for years to come. In the post war years Hamilton was elected to the pre-Constitution Congress under the Articles of Confederation and pursued a distinguished and successful legal career. During this period Hamilton, who was always a prolific writer, began to shine as a political and economic theorist and philosopher. Hamilton really came into his own during the Constitutional Convention of 1787. A major architect of the blueprint of the American Government, Hamilton advocated for a more elitist and less democratic system. As one of the founders who recognized that America needed a strong central government, Hamilton helped to fashion much of the framework of the document. Of particular note, at the convention Hamilton distinguished himself as a fierce opponent of slavery and was arguably the most pro-abolitionist of the founders. Ratification of the constitution by the individual states was not guaranteed after the Convention, as it faced stiff opposition by the Anti–Federalists. Perhaps the key factor in winning acceptance was Hamilton’s co–authorship of the Federalist Papers. These voluminous treatises were written as an argument in support of ratification. These documents serve as a great philosophical landmark that extolled the virtues and benefits of strong and balanced republican government. After successful ratification, Hamilton once again served Washington as the young nation’s Treasury Secretary. In this position he established a new financial structure for the country. This included the establishment of a central bank, a credit system and a structured and planned national debt. He also strongly encouraged a market economy. During this time he engaged in bitter and, at times, personal debates with enemies of these policies. Both Thomas Jefferson and James Madison led this opposition. After leaving the Washington administration, Hamilton continued to exert influence. It was during this period that Hamilton’s actions became the most questionable. When war with France loomed in 1798, Hamilton was slated to be the de facto commander a newly organized American Army. It was during this phase that Hamilton, through his statements and actions, indicated that he had designs on suppressing political opposition in America using military force. He also began to engage in an unauthorized planning of the military conquest of Spanish territories using the reconstituted American army. Around this time Hamilton became somewhat paranoid about his enemies. Hamilton’s scheming was halted when President John Adams, one of Hamilton’s bitter rivals, initiated an unexpected compromise with France that averted all-out war. Subsequently Adams ordered the new army disbanded, infuriating Hamilton. Hamilton’s feud with President Adams, as well as revelations concerning an extramarital affair, eventually knocked the former Treasury Secretary from his position as leader of the Federalist Party. Though no longer the head of that faction, Hamilton continued to play a vigorous part in American political and economic debate. Hamilton was extremely combative with political opponents. He often engaged in anonymous, personal and vituperative attacks on his rivals. He was involved in long running and bitter feuds with Thomas Jefferson, James Madison, and even his fellow Federalist John Adams. He nearly had a fistfight with James Madison. In 1804, his conflict with Aaron Burr ended in the duel where Hamilton was fatally wounded. Chernow presents an account of Hamilton’s and Burr’s rivalry and subsequent duel that is very different from the account that Nancy Isenberg presented in her Fallen Founder: The Life of Aaron Burr. My commentary on that work is here. I will likely focus on this conflict and differing versions of it in a separate and upcoming blog post. For of all his faults, it is worth contemplating the enormous influence Hamilton had on the history of American and Western economics and finance. Beginning with his tenure as Secretary of the Treasury, Hamilton almost single handedly created the modern economic and mercantile United States that emerged in the nineteenth century and helped shape the concept of the capitalistic democratic state that eventually spread throughout the world. Hamilton espoused various principles and structures that were extremely controversial in his time and afterwards. Starting with the economic and mercantile model of Great Britain, Hamilton fashioned an economic structure that propelled the United States into an economic and military empire. Over the strenuous objections, Republicans (not to be confused with the modern day American Republican Party, this early Republican Party has actually survived into present times and is now the modern day American Democratic Party) like Thomas Jefferson and James Madison, Hamilton created a national bank, a system of financial securities, organized the national debt and helped institute a national system of taxation. In complex economic treaties he postulated that such innovations were necessary for a modern commercial based republic. Hamilton advocated for a strong capitalistic system and fiscal policy based upon manufacturing and trade, that was supported but also regulated by a strong, active and involved central government. I observe that today, many Americans, particularly those on the far right as well as the far left of current political thinking, continue to vilify Hamilton’s policies. He was one of architects of the modern, trade based capitalistic world of activist governments and strong central banks. Currently on both sides of the American political spectrum, one often hears calls for the abolition of the United States Federal Reserve as well as the modern banking and finance system. While I consider myself a strong progressive who can be often heard excoriating the power and abuses of the world banking and financial structures, I believe this system, partially founded by Hamilton, has done more good then harm and I would be loath to abolish it. This system is a necessary part of the infrastructure of the contemporary world, without which poverty and misery would be much, much more prevalent. It has been one of the key drivers of human progress. (I grant that there is a strong argument, with technology and industrialization potentially threatening the very existence of humanity and civilization, that it would have been better had a technological-industrial society never developed. That argument is beyond the subject of this particular blog post). I advocate for major reform that curbs on the power and abuses perpetuated by this system. When I look at the policies that Hamilton advocated, I think that he would support such reforms. In our time, many mistake Hamilton for a laissez-faire small government conservative. Hamilton would have recoiled at that description. He advocated a strong central government, with relatively high taxes, that was involved in all sorts of projects ranging from public infrastructure to public education. He championed a government that would take an active approach in both encouraging and regulating commerce. In other words, he established a blueprint for the modern, market-orientated democracies that include healthy doses of government intervention in their economies. Hamilton is often caricatured as an unabashed supporter of the wealthy and financial markets, Chernow points out that this depiction is inaccurate. In terms of a macroeconomic world view, I think that Hamilton got it just about right. There is so much more to Chernow’s book and to Hamilton’s life than his economic theories and accomplishments. In meticulous detail Chernow explores Hamilton’s equally important contributions to Republican government, the American military cause during the Revolution, as well as his upbringing and personal life. 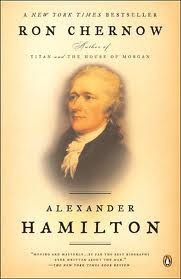 For all of its detail, Alexander Hamilton is an engrossing read and should be of immense interest to anyone interested in the man, his time, or the world that he helped to create. 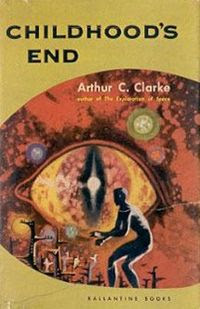 I believe that I first read Arthur C. Clarke’s Childhood's End sometime between 1981 and 1984. I was in my teens at the time. Though I have not reread it until recently, images and ideas from this book have returned to me and, in a way, haunted me over the last thirty years or so. I pondered before this rereading whether Clark’s story would pack the same power and depth for me this time around. I am so much older, and I like to think that I am also much wiser now. To my delight, I am more amazed with Childhood's End now than when I first read it! This is a novel full of big ideas relating to humankind’s place in the universe. First published in 1953, this is in my opinion one of the finest science fiction novels ever written. The early stages of the plot may seem familiar, perhaps even routine to the modern reader. This is in part because since the publication of Clark’s work, many other stories and films have derived key plot points from Childhood's End. However, the later chapters are radically different from most speculative fiction written before or since. The novel opens with the cold war still on and the United States and Soviet Union about to launch the first manned expeditions to the moon. (The book was first published some sixteen years before the first actual manned lunar landing). Suddenly, giant alien ships appear over all of the world’s cities. The aliens, who humans dub “The Overlords”, while keeping their physical appearances hidden, announce that they are taking over. Using incredibly advanced technology they establish a benevolent dictatorship. In a short time, the Overlords eliminate all forms of war and organized violence, discrimination, poverty, animal cruelty and an entire host of additional human ills. Included in the changes is the elimination of separate nations and governments. Some humans, resenting the loss of human autonomy, attempt resistance. The Overlords’ power and technology is so advanced that they are able to assert control and stifle all opposition without the use of violence. They can monitor any place on earth, whether indoors or outdoors. They can immobilize people without harming them. They are even able turn off sunlight in selected regions. The main human protagonist in the early chapters is Stormgren, the Secretary General of the United Nations and Earth’s liaison with the Overlords’ leader, known as Karellen. Secretary Stormgren knows Karellen only as a disembodied voice. During Stormgren’s tenure the Overlords agree to reveal their physical appearance fifty years hence. In the intervening years, humankind experiences a “Golden Age” of peace, prosperity and enlightenment. Creativity and pure scientific development is indirectly stifled however, due to the control imposed by the Overlords. The action jumps fifty years into the future when the Overlords eventually reveal themselves. To the shock of humankind, they resemble winged demons, suggesting Satan himself. Later in the book Clarke provides a neat explanation as to why they appear this way. In the ensuing years we are introduced to three characters; Jean Morrel, a young woman who manifests some psychic abilities, her husband George Greggson, an artistic production designer and Jan, a brilliant young astronomer and musician. Jan eventually stows away on an Overlord supply ship bound for the aliens’ home world. Due to the relativistic effects of the high speed at which the ship travels, during what will be one year of time for Jan, eighty years will pass on earth (the physics presented here are accurate, this would happen in the real world if one traveled as fast as the Overlord ships do). In the meantime Jan and George have two children. The children manifest a psychic connection to the Overlords. The eldest boy Jeffery is able to project his mind over enormous distances and begins to view fantastic scenes of far off planets across the galaxy. The children begin to exhibit telekinetic ability and eventually retreat into isolated mental cocoons. Here the story takes a radical turn. All of Earth’s children begin to manifest the same effects. At this point the Overlords announce their true intentions. The phenomenon is the result of humankind moving into a new stage of existence as many intelligent races do. The children are no longer really human and are mentally melding into a strange collective mind. Eventually they will join with a vast galactic group conscience called “The Overmind”. The Overlords came to Earth to help shepherd this process. It turns out that the Overlords are really just servants of the Overmind. They are an unusual and “stunted” race as they were never able to transform into a collective mind. For the safety of both the children, who are no longer individuals, as well as the human adults, the Overlords relocate all of Earth’s adolescents to Africa and isolate them from the remainder of the population. With the transformation and loss of the children, humanity is doomed to extinction. While many decide to live their lives out, others, despairing as to the dead future, commit suicide. Jean Morrel and George Greggson perish in a group self extinguishment. Meanwhile, after eighty years have passed on Earth, Jan, having experienced incomprehensible wonders on Overlord’s home world, during a time that for him was only a year, returns to Earth on an Overlord supply ship. The last humans have died off and he is the only real human alive. The “children” exist in a bizarre single minded herd that is still developing its powers and moving toward a melding with the Overmind. Clark’s description of this herd is strange, haunting and disturbing. It is one of the highlights of the book. When the herd becomes so powerful that it begins to change the orbit of the moon, the Overlords abandon the earth out of concern for their own safety. Jan decides to remain, the last individual human being in existence. Using the Overlord’s instruments, Jan observes the final transcendence of the herd as it shifts to a higher plane to become part of the Overmind, destroying Earth in the process. Humanity and all of its achievements and aspirations are gone in the end. Clark seems to be saying a lot in this work. He emphasizes that the Overmind is so far advanced, and so vast, that humans can never even comprehend its intentions. Whatever its motivations and stratagems are, individuals could never come close to even appreciating them. Ironically, the Overlords are limited to individuality and can never merge with the Overmind. They have more in common with humans beings than with the Overmind. Both the Overlords and Jan seem to glimpse that there may be something higher and deeply profound going on with the Overmind. It is only a feeling, however, and neither is capable of understanding or grasping anything meaningful about it. Our minds and abilities are just too limited. The book is full of references to great human art, music and scientific achievement, as well as human virtues such as love and heroism. Clark gives the impression that such human aspirations, accomplishments and emotions are insignificant when compared to the sheer vastness and impenetrability of the physical universe. This universal immensity and enigma seems to be represented by the Overmind. At the same time, the book’s characters, both humans and Overlords, appreciate and extol art, culture, positive feelings and great individual endeavors. The Overlords have a vast museum dedicated to the science and culture of various amazing civilizations. At the moment of his death, George Greggson takes comfort in the newly reawakened love for his wife. Jan, all alone on Earth, takes solace and joy in the works of Johann Sebastian Bach. In the last lines of the book, Karellen pays tribute to human individuality. For us small and mortal creatures, things such as art, creativity, love, etc. are all we have. However, such earthly preoccupations, like humankind itself, are ultimately small and completely inconsequential in a gargantuan and inscrutable universe. These things that are so valuable to us can and will eventually become extinct, both in the book and in reality. Though not identical, I think that the themes presented in this novel share certain parallels to the ideas presented by E.M. Forster in A Passage to India. Forster’s characters also confront the great incomprehensible vastness of creation that dwarfs human concerns. My commentary on Forster’s novel is here. There are other interesting ideas presented in this book. For instance, Clarke seems to be advocating what in our time would be called a secular humanist civilization as the best path forward for humans. His “Golden Age” is brought about by an altruistic, peaceful, and rational society that rejects all superstition and religion. The author was also amazingly prescient in his predictions on the popularity that both television as well as fast food would achieve in the later part of the twentieth century! Childhood's End is not a perfect novel as it has its flaws. Clarke’s characters, while at times seeming to show promise, are underdeveloped. Also, some of the early chapters involving the kidnapping of Stormgren come off as a little trite, and not really worthy of a work filled with such important ideas. Nevertheless this book is a feast for the adventurous mind. The novel is at once full and challenging as it presents disturbing ideas about the nature of humans and where we fit into the cosmos.